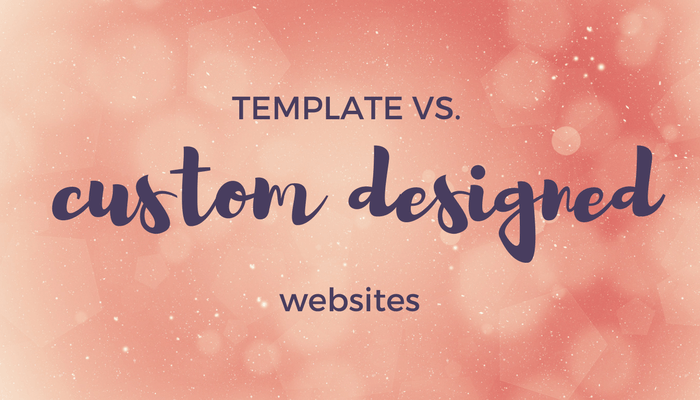 When it comes to website design, there are two main routes to take - template or custom build. There several advantages and reasons why I use a custom build for my clients. #1. A custom build allows you to start with a clean slate. Like a tailor made suit, every element of the website is custom designed to fit your business needs. With a custom build the web designer can take your business objectives, your goals and what you are trying to achieve visually and functionally to build a site that does exactly what you want it to do. #2. Custom-built websites are better positioned for future growth and can grow as your business grows. When the time comes to update an aspect of your website, significant changes can easily be made. #3. With a custom design you can get really fun and do something that helps you visually stand out. #4. Because they are built with you and your business objectives in mind they are able to make you more money and meet your long-term business goals faster. #1. The disadvantage of a custom site? They cost more and take longer to build. Template sites are themes or layout pre-built by someone else which companies and individuals can then populate with their content. You basically find a template that most closely matches what you need and make small customizations with colors and images. #1. They are less expensive and can be more quickly built. #2. If you’re just starting out in business and on a small budget, templates can be a great way to go to get you up and running and somewhat professional, while you build your business. #1. It can be difficult to find a template that matches your needs exactly and the websites can sometimes look “cookie-cutter”. #2. You are limited on how much you can customize the site; what you see is what you get. #3. A theme often has a whole variety of built-in features and functions jam packed into the theme, many which you will not use and will ultimately weigh your website down. #4. A pretty theme isn't enough to have a website that makes you money. All of those pretty themes out there only capture just one tiny part of the equation and leave everything else on the table for you to figure out. reach their goals or make them money. I’m tired of WordPress themes that are merely creating "pretty pictures" online, and don't actually help you rake in more e-mail sign-ups, more product purchases, or more contact requests. Because when you have a website that looks good AND converts (i.e. makes you money), you've got yourself a thriving business.